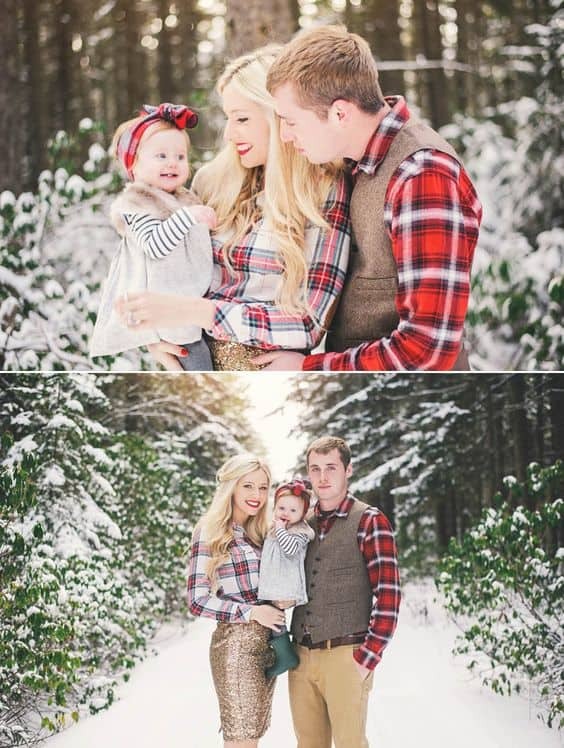 Do you cringe when scheduling family Christmas pictures? What poses would be best? How on Earth will you keep the kids from tearing everything down? While I will forever treasure family Christmas pictures, I am always thankful they are silent. It was still a pretty picture. If you are in the same boat and looking to make this year’s photo session a tad bit less chaotic, my list is for you. 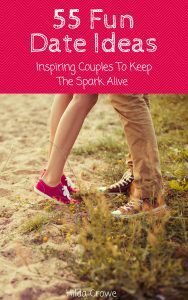 All of these are family-friendly and will inspire you to take fabulous, yet simple-to-pull-off pictures. No matter how cute your Christmas family picture ideas, the hardest part is to make them happen. To ensure your ideas become reality, check out these tips on how to take the best family Christmas pictures. 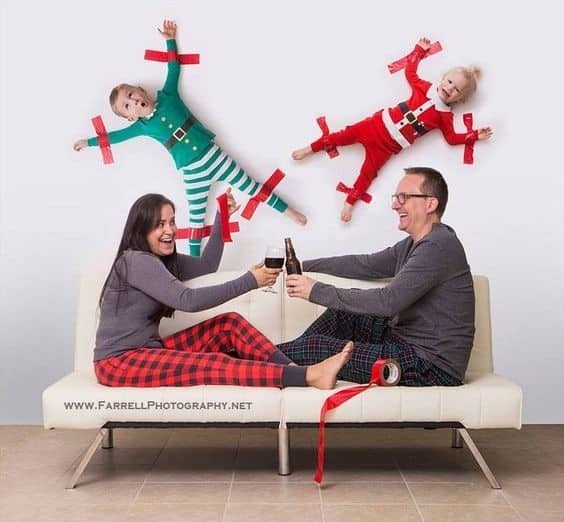 As a mom of 4, I have a pretty good idea of the chaos that Christmas pictures stir up. While there’s no fool-proof method (that I know of!) to perfectly behaved children, here are a few pointers to lessen the stress. When kids have to sit through something boring and make smiling faces while doing it, you’d better make sure you gave them something fun to look forward to in the end. It can be a favorite movie, a new toy, getting a treat or other outing that would make your child bear this time with a bit more ease. It is so much easier to get children to pose for pictures when they feel pretty and feel themselves. Forcing an itchy dress on a tomboy will totally backfire. 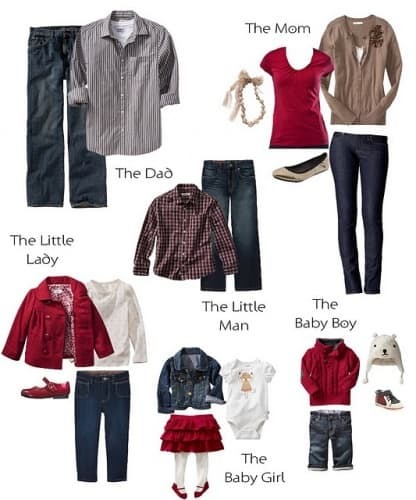 I get it’s difficult to give children choices because you want to coordinate their outfits on the Christmas pictures. However, you could always let them choose between a few acceptable shirts or whether they want to wear pants or a skirt, etc. Try to be creative and offer them a choice within your limits. One year I told my girls they will be wearing red shirts and either a white or black furry vest. Guess who had fun choosing their exact pieces in the store? Yep, they did and as a result, they loved wearing them. I am a minimalist at heart, so I find it a fabulous idea to schedule a short 30-minute session and get a few good pictures out of the deal. Not only will you save money, the photo shoot will go by fast and your kids will thank you. 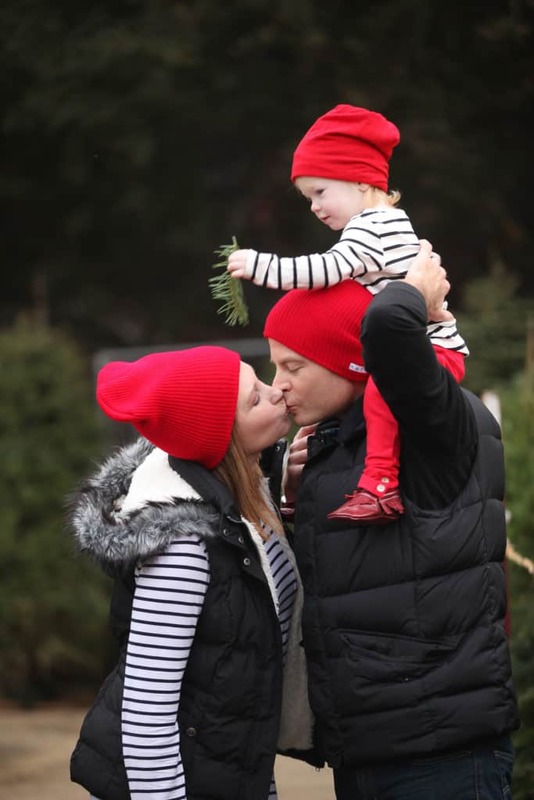 If you are able to let go of “Pinterest perfect” and embrace the reality of a family, you will soon discover that keeping a Christmas photo shoot simple is the best way to go. Perfect curls won’t matter a few years down the road, neither will the elaborate background. Genuine smiles are so much more important for good pictures than glittery gift boxes and professional makeup. Honestly, mamas, aren’t we usually the ones who stress over all the details and forget to have fun? If we strive for perfection, we will either sound controlling or discouraging. None of those help the family keep a cheerful spirit. Check in with yourself and make sure you are ready for the Christmas photos with a good attitude. The easiest answer to this is to ask your photographer what works or what doesn’t. 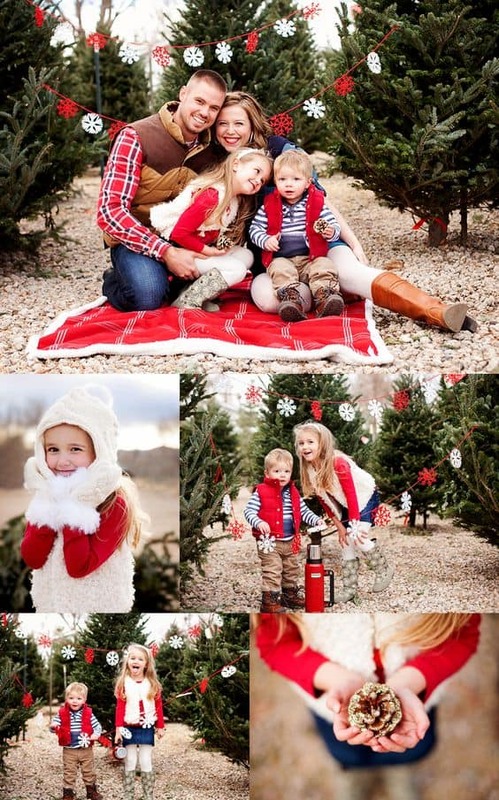 Depending on the weather and the location of your Christmas pictures, these may be completely different for each family. Here are a few universal rules though, to get you started in the right direction. Instead of trying to dress everyone in the exact same color pairings, choose a pretty color scheme and pick outfits accordingly. For example, choose 2-3 neutrals and pair them with two colors. Wearing all white or black isn’t going to look great on pictures. Definitely, have a plan in advance otherwise you will be stressing out on the day of the shoot. Textures and layers definitely take a family picture to the next level and add interest. 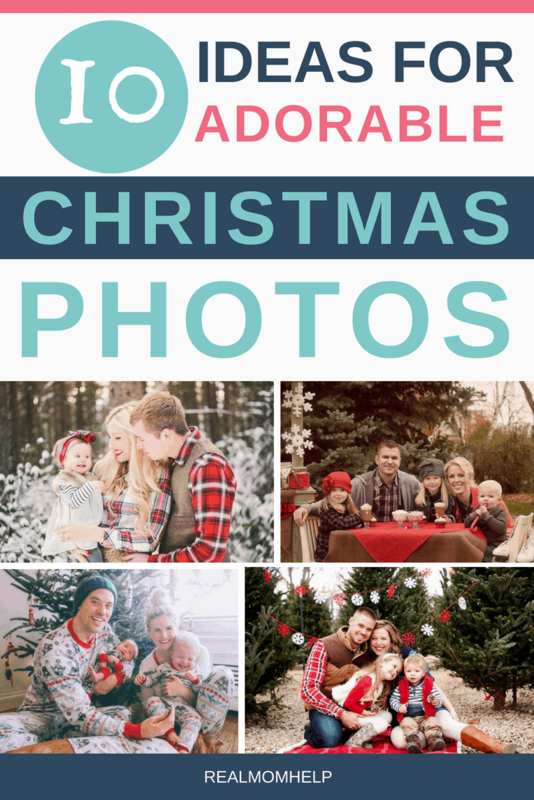 They work especially well with Christmas family photos because you have tons of options to wear: tights, knitted cardigans or vests, plaid or checkered shirts, a tie, bows, jewelry, etc. A ponytail may look great in real life, but it can look unflattering on pictures. There is a reason why modeling is an art. Consider wearing your hair down in a natural way to frame your face and achieve the most flattering look. If you planning on displaying the pictures in your home, think about what colors and atmosphere you want to create. What matches your family’s style and the feel of your home? Keeping these in mind will naturally make the new pictures a part of your house. Probably not everybody should wear patterned clothing because it will only make the picture look super busy. Logos or characters on shirts will distract from the faces. Generally speaking, it’s a good decision to avoid them altogether. Often, photographers offer Christmas specials starting as early as August-September. They either discount the prices for mini sessions or offer special prices and locations for full-length sessions. Find local photographers on Facebook or ask for recommendations for one in local Facebook sales groups. Starter photographers or hobby photographers often look for material to fill up their portfolio. While you may not get the most perfect pictures, they are likely totally good enough to make cards and display them around the house or at grandparents’. When somebody is passionate, they spend time practicing and newbie photographers can really be quite good. Ask to look at pictures they have taken, ask for a few references and talk to them about how they handle photo shoots. These should give you a good idea if that person fits your family’s wants. Finally, the prettiest part of this post. Outfit inspirations! Picture credit and idea: Real Farm Wives of America. This was our inspiration for last year’s family outfits, and it was a huge success. I was able to score some items at a second-hand store, and the other items are staples so we didn’t break the bank. Not only did we look cute (if I may say so myself), I wasn’t overly worried about what the kids did in their clothes. I love the casual yet festive feel of this look. Here’s another idea that won’t require too much prep work and clothes shopping, but will definitely be off the cuteness meter. With more kids, mama could have one on her shoulder too or older ones could squeeze in between the parents. We may have to try this with our 4! Image credit and idea: Sara Garcia Photo Art. I love the cozy blanket that sets the picture apart from others. Nestled between pine trees with a simple festive backdrop, this one is a keeper. And who knows, maybe you buy your own blanket and use that every year in front of the Christmas tree, to keep track of how much everybody has changed over the years. Sounds like a cool new tradition to start. The legwarmers will definitely accentuate said chubby legs. Image credit and idea: Livingly. What’s easier than staying in your own element and take family Christmas pictures at home in your matching PJs? This idea is just as cute as any, and you can do it using a tripod and Bluetooth remote in your living room! Image credit and idea: Connection Photo Blog. I love mixing casual and dressy, and this picture idea does just that. 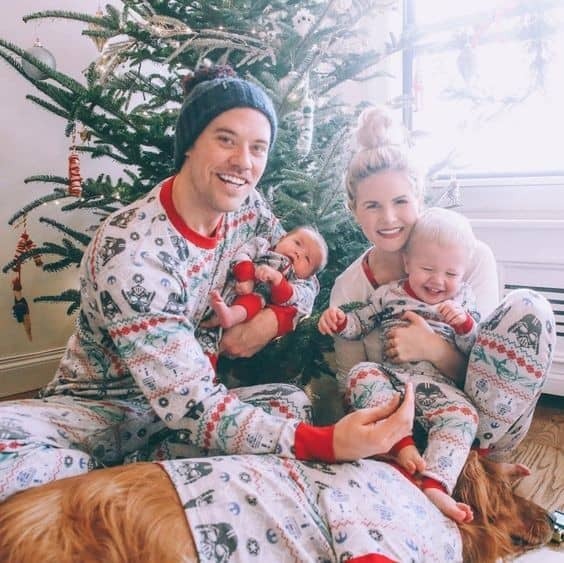 You don’t need a lot to make baby’s first Christmas family picture totally unique. Picture credit and idea: The Sweetest Occasion. While the original idea is for a newlywed photo shoot, I imagine this to be a Christmas baby announcement picture idea. I could never wait too long to announce my pregnancies, but if you can or if you’re lucky enough to find out right around Christmas, this idea is perfect! Picture credit and idea: Farrel Photography. I think this picture tells the part of the story most Christmas family photos omit. It definitely has everything to do with reality. If you’re up for a silly family picture you can laugh at for years to come, this is it! Picture credit and idea: Inspire and Instyle. If you want some Holiday glam, family style, dress the adults in an evergreen (get it?) formal black outfit and let the kids steal the show in their fancy new Holiday clothes. For inspiration, I love this dress and this one for girls, and this one and this outfit for boys. Picture credit and idea: Itty Bitty Portraits. 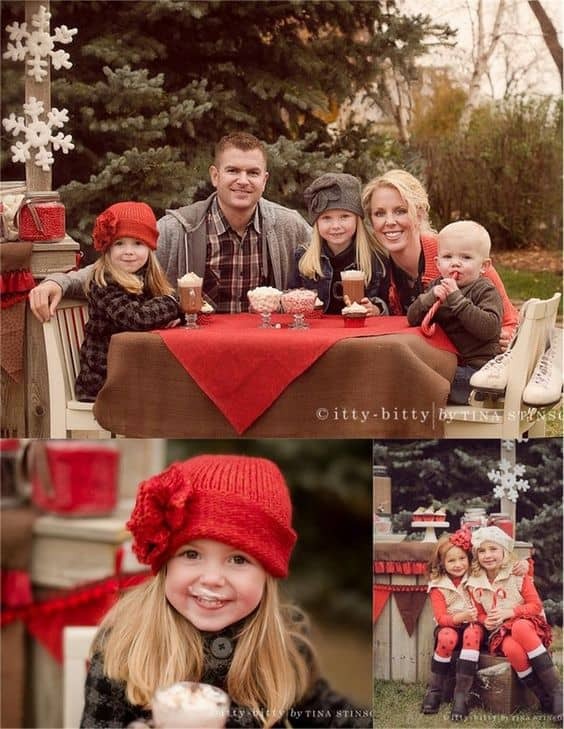 Hot chocolate, marshmallows, and candy canes go hand-in-hand with your family Christmas pictures. 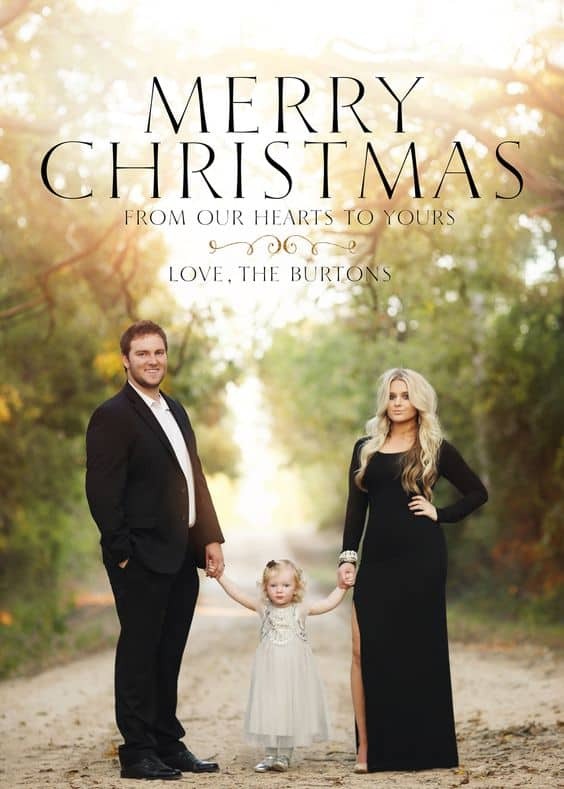 I hope you enjoyed looking through these adorable family Christmas pictures and found some inspiration for your own family. 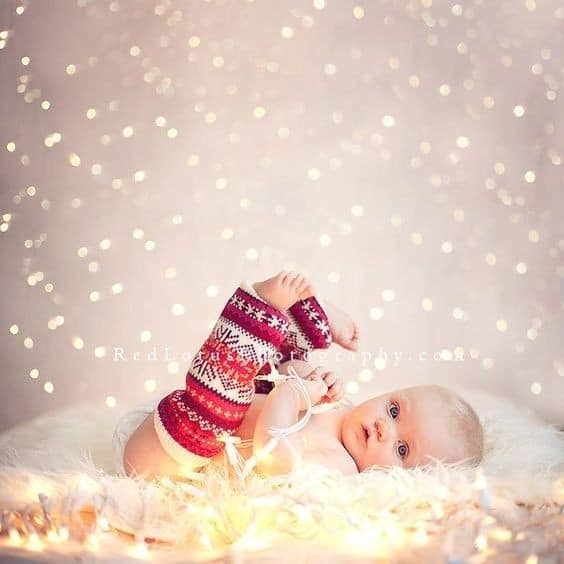 I’m getting ready to do my first ever xmas pics with my little offspring! Couldn’t have found a better post 🙂 – Thanks so much for joining my Pinterest Blogger Board Hilda! I am so glad you found my post helpful! Good luck on the Christmas pictures. And thank you for having me on your board!